My highly acclaimed, best-selling book offers what every modern parent is seeking-a gentle, sensitive and emotionally appropriate approach to establishing positive sleep practices; when possible, from birth onwards-by using my Gentle Sleep Shaping and Percentage of Wakefulness Approach for New-borns to 6 months and/or my Gentle Sleep Learning Approach from 6 months to 6 years of age designed to encourage developmentally relevant Sleep Ability-independence, less interrupted and more consolidated sleep tendencies. A wonderful resource- helping to reassure, give confidence and inform and manage parents’ expectations for their child’s sleep depending on their age and stage. Following years of training, education and working directly with families I developed an effective and practical approach for parents in this modern age of parenting. I felt that it was important that I share my work in this book-so that parents are no longer forced into rigid, scientifically inappropriate routines that have no recourse to the child’s or the parents well being. My book provides the information to encourage parents to establish positive sleep practices and overcome sleep challenges without feeling under pressure to resort to rigid, inflexible, cry-intensive strategies. 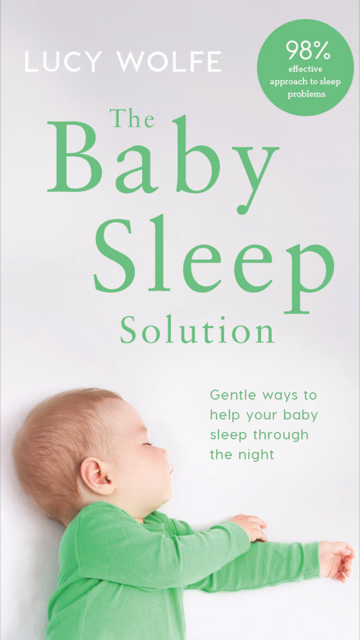 In my bestselling book, The Baby Sleep Solution, I have introduced my ‘Stay-and- Support’ approach with an emphasis on your baby and child’s emotional well-being. This practise has helped thousands of parents and babies around the world achieve better sleep, with most parents reporting improvements within the first 7 days of making the changes. When you have placed your order -your PayPal receipt confirms that we have received your payment and we ship on that basis- to the address supplied. All books are sent from Ireland by standard post, please allow reasonable time for delivery. Delivery times vary depending on the destination; usually delivered next working day in Ireland. International items take from 3-7 working days. sleeps all night thanks to your book.. I absolutely love your book it has helped my little one so much and she is now is a great bedtime routine and sleeps all night thanks to your book..
Just wanted to say how much I've loved your book. I ve used it from day one and my baby has always been a great napper and sleeps through the night. But recently he has started acting up with his naps. I took out the book again this morning after nearly a year and followed the correct sleep/nap times mentioned for his age group. He's gone from 30 minute cat naps and no afternoon nap to 2.5 hours and counting. Lifesaver!! I downloaded your book last Sunday after my 5 month old was waking hourly! From the first night she slept only waking twice and settled very quickly. Now we've had 2 nights where she's slept from 7-5 waking for a feed and back to sleep until 7am. I am so pleased with the new routine and the results it's having. Thank you Lucy! Oh WOW! I changed one thing, haven't read the whole book yet and my daughter slept through the night for the first time in weeks!!!! I'm gobsmacked!! Thank you. Thank you, your book is amazing. Thank you, your book is amazing. In just one week our baby is now sleep from 7pm to 7am. At one point she woke every 2 hours. The evening meal at dinner time as opposed to lunch and the last bottle 45 mins prior to bedtime were the turning point for us. Thanks again. I was about to quit breastfeeding and it was breaking my heart to so this was a last resort and I am so happy I tried this first. This is not a request for help so sorry for clogging up my inbox but I just wanted to thank you. In 5 days your book has helped by 5 month old breast fed baby, who has never slept for more than 2 hours at a time go to having 2 hour naps and sleeping at night for 5 hour stretches . I now only feed him twice overnight between 7 and 7. I was about to quit breastfeeding and it was breaking my heart to so this was a last resort and I am so happy I tried this first. Thanks again! Within a couple of days the difference is already unbelievable!! I am so pleased with the new routine and results it’s having. I downloaded your book last Sunday after my 5 month old was waking hourly! From the first night she slept only waking twice and settled very quickly. Now we've had two nights where she's slept from 7-5am waking for a feed and back to sleep until 7am. I am so pleased with the new routine and results it's having. Thank you Lucy! Now she sleeps through!!! 730pm-730am!!! She now sleeps 10/11 hours a night at 6 months, so very happy parents here! Thank you Lucy for saving my sanity! W was napping in her cot from day one of using your book. It took a few weeks to be able to put her in and walk away without helping her to go to sleep but we got there so thank you. She now sleeps 10/11 hours a night at 6 months, so very happy parents here! Thanks again. Lucy Wolfe knows what she is talking about!! This book has made our lives so much better. If you need a better sleep for you and your little ones, give this a try. Lucy Wolfe knows what she is talking about!! Our first 7pm-6am of unbroken sleep EVER!! Your book is easy to follow and really covers most eventualities. I downloaded your book last Sunday after my 5 month old was waking hourly! From the first night she slept only waking twice and settled very quickly. Now we’ve had 2 nights where she’s slept from 7-5 waking for a feed and back to sleep until 7am. I am so pleased with the new routine and the results it’s having. Thank you Lucy! Hope you are well, I briefly mentioned on your instagram last week about our success story with our little ones sleep pattern. He was 7 months and (me being a new mum thought he would “automatically slip into his own nap routine) would not sleep pass 45 minutes for his nap and the same in the afternoon. I knew naps during the day were important for his development that infound myself spending the whole daytying to get him to rest. He was even waking at 5am on que every too. He is a great night sleeper, just pop him in his cot and off he goes. Just want to say thank you for your book! Lucy your book has been our life line. The Baby Sleep Solution was the perfect solution for our little family. This is a perfect present for any new parents.